That's my take on Kinder's new, "Have you played today" campaign". The gist of the campaign? Treats are an important part of parenting and so to be better parents you've got to make sure you give them treats, more specifically - Kinder chocolates. 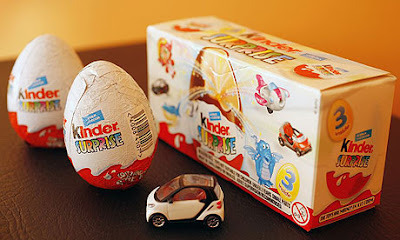 Now it's true the chocolates are smaller than regular Kinder chocolates, but that's not really the point. The point is here's a campaign with an incredibly unique marketing pitch. Forget probiotics, omega-3 and fibre. Here we've got chocolate being pitched as a parenting tool; a pitch that suggests that you're a bad parent if you don't give them Kinder eggs. By recruiting experts to push their message. Experts? What expert in their right mind would agree to pitch chocolate to children under the banner of good parenting? Two in fact. Registered Dietitian Mary Bamford and child Psychologist Dr. Anthony Volk. "For younger children, allowing around 100 calories per day as a treat allows you to teach the importance of portion control. Older children and female teens are allowed 150 to 200 calories per day and 200 to 400 calories per day for active teen boys." "The Kinder Survey reveals that 91% of dietitians agree that parents should feel comfortable including chocolate in their children’s diets on a periodic basis." Encourage sharing between children, promoting patience, fairness, and social skills. Help build positive parent-child relationships. Show children that their parent is concerned about making them happy, and willing to do things that make them happy. Set a positive mood to make a child more receptive to what a parent has to say. Foster positive interactions between parents and children. Giving and receiving treats – shared moments of joy – can help to build strong parent-child relationships." To be clear, it's not as if my wife and I never use food treats with our own children - we surely do but certainly not every day. More importantly our food treats are never given as rewards like Kinder's purchased experts suggest. Why not? Because it's thought that rewarding with food treats (called instrumental feeding) encourages and teaches children to eat for a myriad of cues and may further their risk of eating more than they need, which is probably why in guidelines on the treatment and prevention of childhood obesity rewarding with food is explicitly cautioned against. So when do we use food treats? Pretty much on a just because/sometimes food basis and we certainly don't link them with the completion of any activity or eating behaviour. We do however treat regularly. Treats may be "special time" with mom or dad, telling them how proud we are of them, how much we love them, warm hugs, favourite activities, etc. "I think we live in a consumer society, and it’s very refreshing to see companies taking interest in the welfare of children that they’re marketing to. You have to buy things for children, so for a company who wants to sell to children, I think it’s very responsible that they actually try to get experts on board"
Dr. Volk, Kinder's job is to sell chocolate. They used you to do that. Nothing refreshing about it.